In this tutorial, we will see how to use PHP to validate the data collected from a form. Following is a live demo of the PHP form we will create by the end of this tutorial. The following picture shows what we need to do while validating a form. We have used bootstrap for styling the form, but for a few styles we have added some custom styling. We have used POST method and action="<?php echo $_SERVER['PHP_SELF']; ?>" states that after submission form data will be handled by the PHP script present in this file only. You may opt for sending form data to a different file. Note that all the code snippets under "Code for validation" are wrapped by if (isset($_POST['submit'])) and }. In practice you may keep all of the codes within a single if (isset($_POST['submit'])) and }. And now you need to disaply a messge informing user that the form is validated. So, we add a single line of PHP code immediately before the form starts. IF you wish to send data collected through this form after validation to someone's mail address, following code would help you to do so. 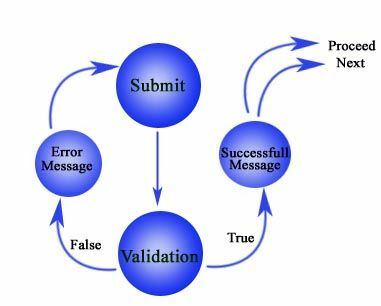 So, if you try to understand how to write code for it step by step, step 1 is to declare the mail address to whom you want to send mail, step 2 is to write subject of the mail, step three is to collect data from POST so that you can write them to the body of mail, step 4 is to declare the mail id from which the mail is coming and finally sent mail with PHP mail() function. You may print some message after sending mail optionally.